I have used Mi-Feed Micronised Stockfeeds for a long time before being sponsored, I moved to Qld 12 years ago & started using Mi-Feed 10 years ago when I brought my hack with me. I have always tried to use naturals feeds as my father who was a jockey & owned a stockfeed business in Sydney swore by natural feeds as you could see what you were actually feeding. Mi-Feed fits this description as you can actually see the grains you are feeding your horses, the micronising process gelatinises the starches in the grain, therefore is more easily digested & reduces the risk of colic & other digestive disorders. All the horses that come to our property to show or be agisted are fed on Mi-Feed. Our horses have won at Royal’s & HOTY’s, runner up at Grand National’s competing three years in a row. I have fed our brood mare who is 21 years old with an 8 month foal just weaned, on Mi-Feed Bulk Up. During her pregnancy & lactation she was fed Mi-Feed Breed Performer. All our hacks are fed Bulk Up & Micronised Oats, the ponies are on Mi-Feed Easy Rider & Mi-Cool Horse & Pony Pellets. 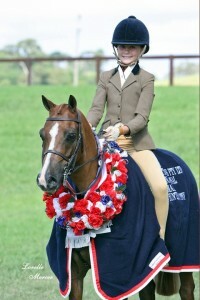 Feeding all natural has worked extremely well for us, & our horses are always in top show condition. 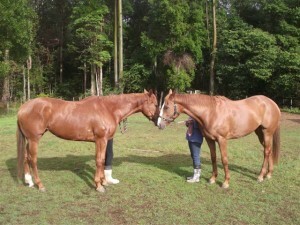 Both of my Thoroughbred Mares had been spelling from February 2013 to the end of April 2013, they both arrived home malnourished with ribs visible. My mare Khandi Khi was put on strong antibiotics by the vet and farrier Brett Warren had to apply heart bars to both front feet. While the other mare SP Mystic had cellulitis in both her back legs, and her coat was dead and her eyes dull. Within 3 weeks of returning home both mares coats had shine and life, gaining an enormous amount of weight, with all ribs covered. Both mares are well on the way to healing thanks to using Mi-Feed Bulk Up, Micronised Oats and Horse and Pony Pellets. When young horses are sent to us for show we always start them on Mi-Feed Bulk Up until at the desired weight and then use Mi-Feed Easy Rider Cool Mix to maintain the weight. Our very special thoroughbred broodmare Kelly was a 19 year old maiden mare, prior to being serviced by Stuart and Cindy Ross’s stallion Charmed, she was given a specific diet which consisted of Mi-Feed Breed Performer, Bulk Up and Horse and Pony Pellets. She is now going on 21 years old with a nearly 6 month old colt foal.